One of Robin Williams&apos; most memorable roles was as Genie in Disney&apos;s classic 1992 film, Aladdin. What most fans don&apos;t know is that Williams and Disney (the company, not the man) didn&apos;t see eye-to-eye on certain aspects of the project, namely the merchandising. According to an article in the November 1993 issue of New York Magazine, Williams&apos; role in the movie was supposed to be a lot shorter, but he "wanted to leave something wonderful behind for his kids," so he ended up recording around 30 hours of written and improvised dialogue. Disney loved what he did what the character, so the film was rewritten to make Genie a pivotal character. Williams made less than he normally would for a film (only $75,000), but he had an agreement with the company that his voice would not be used to sell merchandise for the film. Everyone who was alive in 1992 knows that promises were not kept, and Williams was not very happy about it. "I don&apos;t want to sell stuff," Williams told New York Magazine. "It&apos;s the one thing I don&apos;t do." He explained that the dolls made for the Mork and Mindy show were OK, because the makers of the show own the image, but that Disney crossed the line when they used his voice, a major part of who he is as a person and an entertainer, to sell merchandise. The company apologized and said that it wasn&apos;t their decision; then, they tried to make it all better by gifting Robin Williams a Pablo Picasso painting that was worth $1 million. The self-portrait is of the artist imitating another famous painter, Vincent Van Gogh. Williams didn&apos;t want the painting and once joked that he would make a copy of it so that the copy could be burned on television. The burning of the Picasso didn&apos;t happen, but Disney and Williams eventually made up, and he went on to work with them for the Aladdin sequels and Jack, only to have another falling out after they made Bicentennial Man in 1999. Upon learning of his death last week, Disney&apos;s CEO Robert Iger released a statement, and the company sent out a tweet that called the actor "a true Disney legend" and a "beloved member of our family." There is no word on what happened to the Picasso. R.I.P. 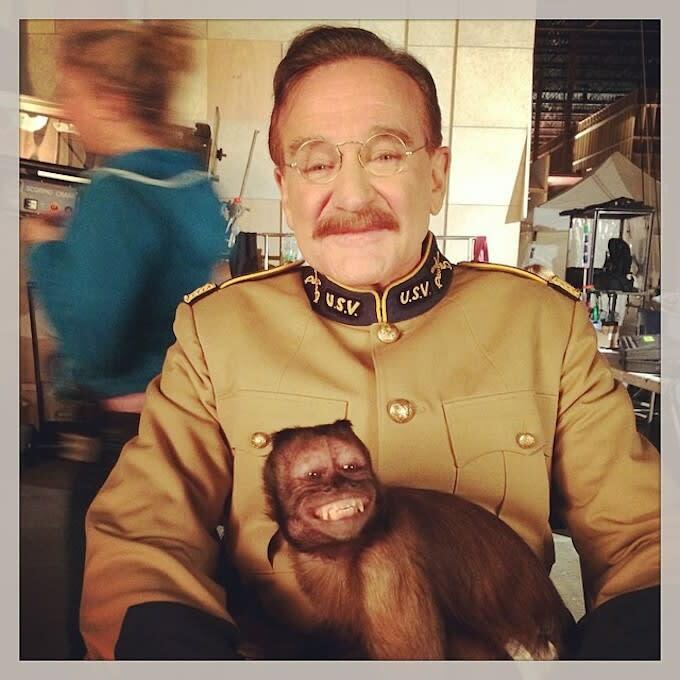 Robin Williams.